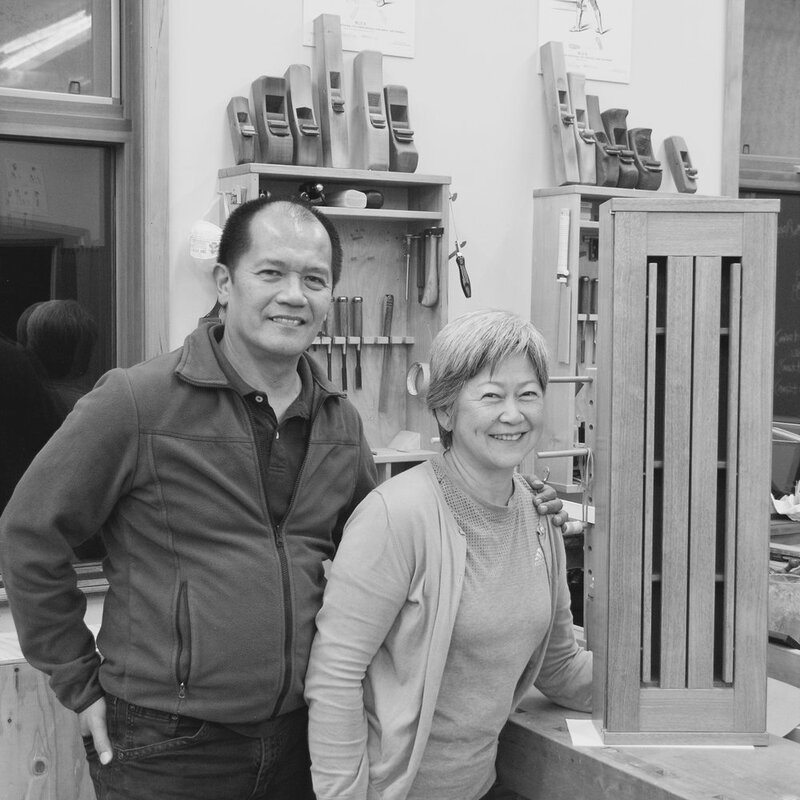 This past week, we completed the fall term of our Impractical Cabinetmaker program. While students continue to enjoy 24/7 access to the school, this term we returned to our six day a week teaching schedule. Saturday is a special day at the school for me. We begin the day listening to one of Jim’s lectures and watching a slideshow from his archive. The rest of the day is dedicated to lectures that do not require machines and individual consults. Advanced program students and I have the opportunity to review their upcoming work and principle steps. During Henry’s first visit to the school he wrote a blog about his time here. I found out this term, that it was his blog that was responsible in part for for Tang first attending our school. I am so grateful for this and for the opportunity to work with such a lovely man. It has been such a pleasure to work with such a kind and gentle soul. 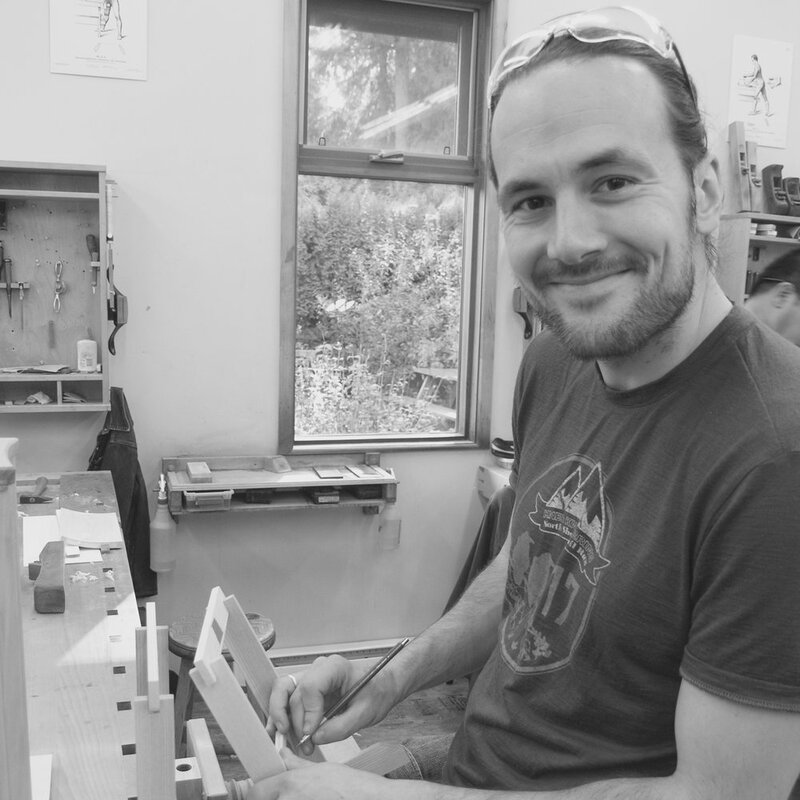 I am so pleased that Georg intends to balance woodworking with gardening when he returns to Mexico following the program. Georg like many of our students was new to the craft. On the final day of the program, as I sat with a cup of tea on the porch. I watched Georg plane the surfaces of his curved veneered panel. The taping as he set the plane, the shavings that surrounded his bench and the smile on his face. I was filled with a deep sense of gratitude. At the end of summer term, we had a last minute cancellation. I’m not sure who we lost, but I am so happy we had the opportunity to work with Fu. 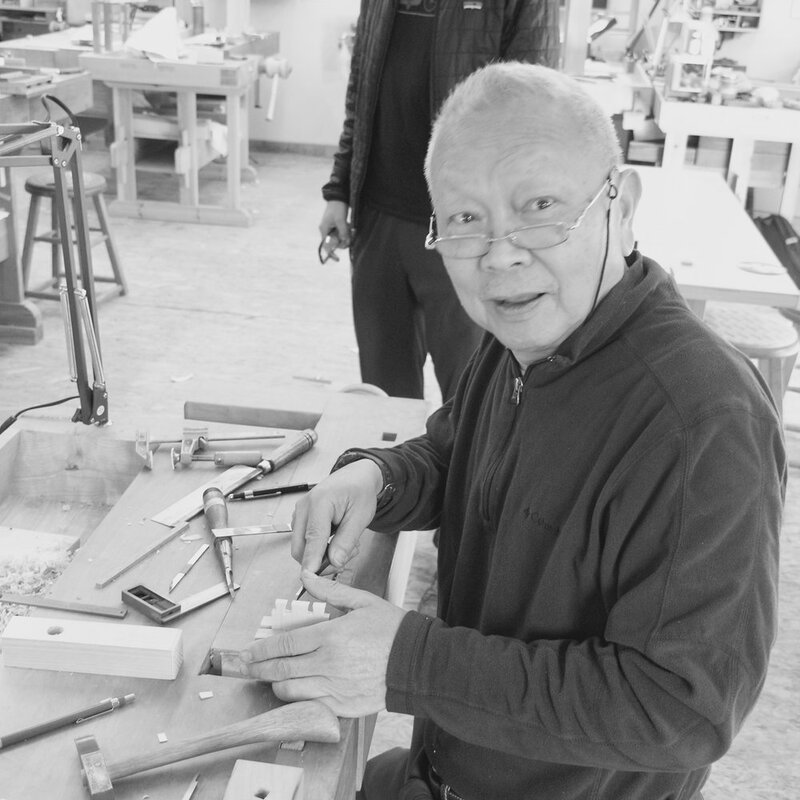 He is a very patient man with a background in furniture manufacturing in his native Taiwan. 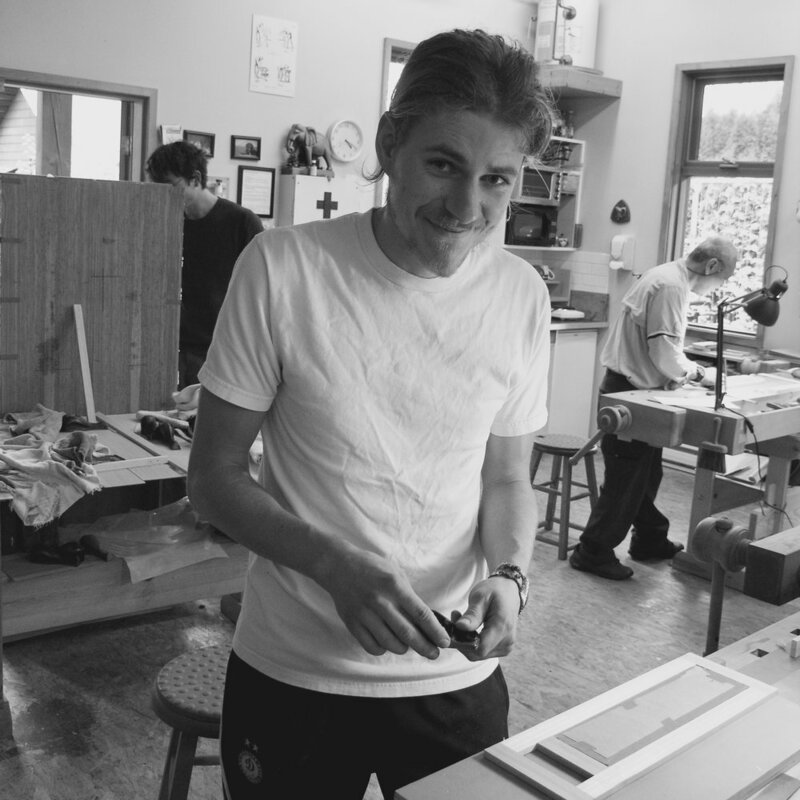 Matt is a talented young craftsman who took full advantage of the 24/7 access to the school. 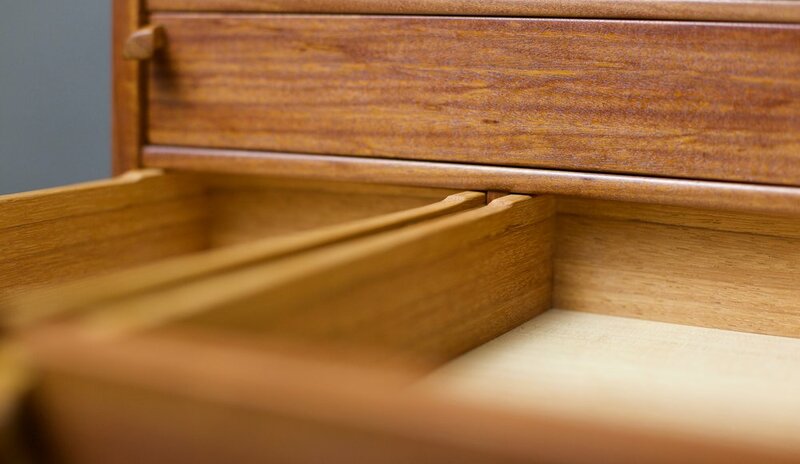 In addition to completing all his exercises very well, Matt made a small dovetailed box in curly maple with a veneered sliding lid featuring parquetry, a very ambitious side project, beautifully done. We very much look forward to his return this spring for the Upward Spiral program. 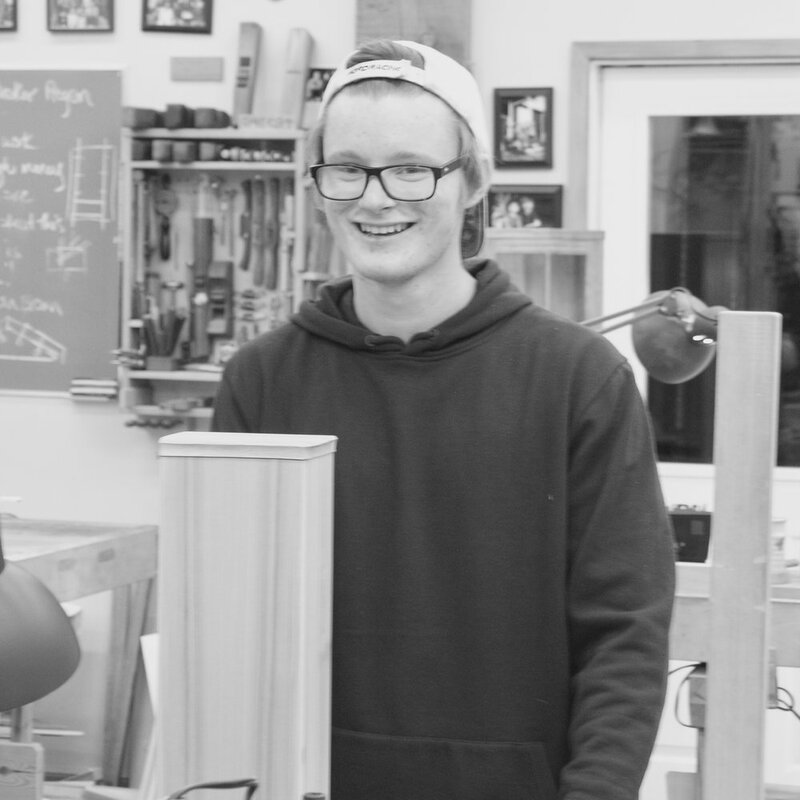 Already a skilled woodworker, Greg used his time at the school to refine his hand skills and in doing so, did some of the tightest work we have seen in the Impractical Studies program. 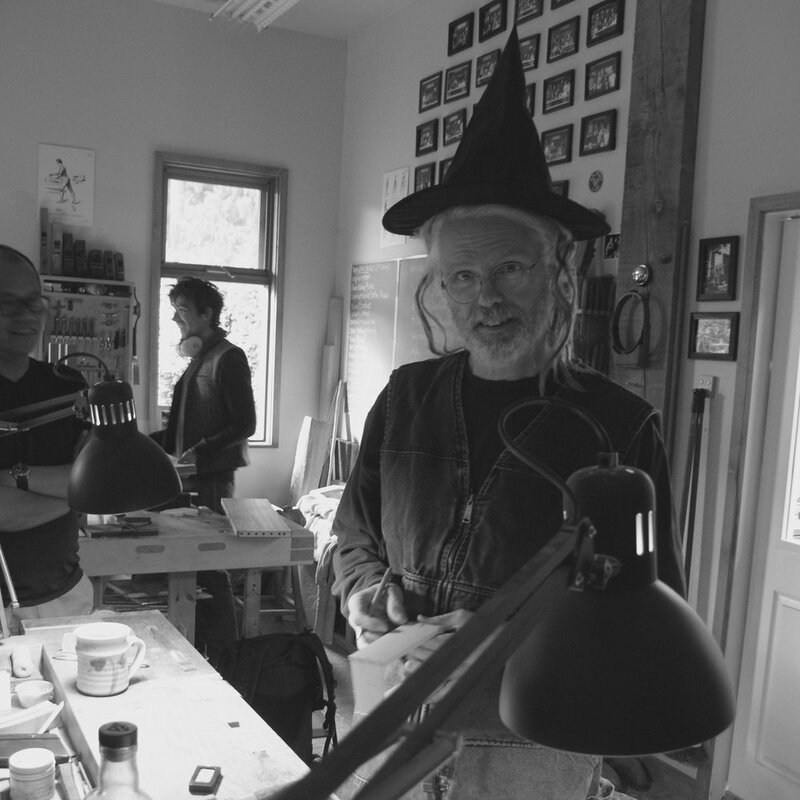 Greg's passion for the craft was most evident in his work. 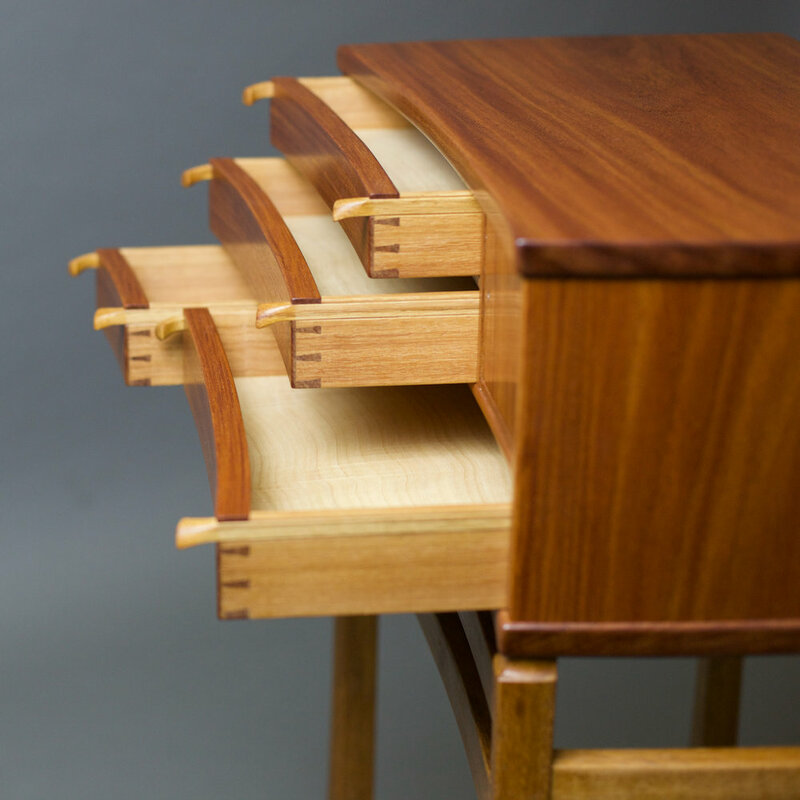 Even having come from a machine heavy environment, Greg really embraced the emphasis on handwork here at the school. Watching Torrie develop as a craftsman has been a joy for me. We are so grateful to have this fine young craftsman back for the Upward Spiral program next term, as he continues on his journey. Torrie shares his passion for the craft with his wife Maggie, who was regularly in attendance for the Saturday morning lectures and carries the other end of the plank. The wizard hat was Yvonne’s suggestion for the dark arts lecture. I am including this image because I still love her, even though she often makes strange requests and suggestions. Andre during the presentation of his upward spiral. Andre made a fine pipe cabinet out of a piece of garry oak, a piece that had been resting in my workshop for a few years. I bought the piece on a wood run to the Frazer valley with the pipe cabinet in mind. We are grateful to have Andre returning for the winter term for Vidar’s chair. Tang completed Impractical Studies last fall and went home, making several pieces before returning for the Upward Spiral program this past term. During the presentation of his fine pipe cabinet Tang shared with us his approach to the work; care, competence and confidence. While on the coast Tang’s wife Judy joined a local quilters group and was immediately embraced by the community. We very much look forward to their next visit. Andi’s showcase cabinet is staged for the first time, a moment of celebration and impromptu walkaround. Sharing of the work with one another continues to be an important part of learning at the school. This past term, was Stan’s sixth visit to the school. His first was during the last year Jim spoke at the school. Stan completed the Artisan program the rather condensed previous incarnation of Impractical Studies over a few summers while still working as an engineer. 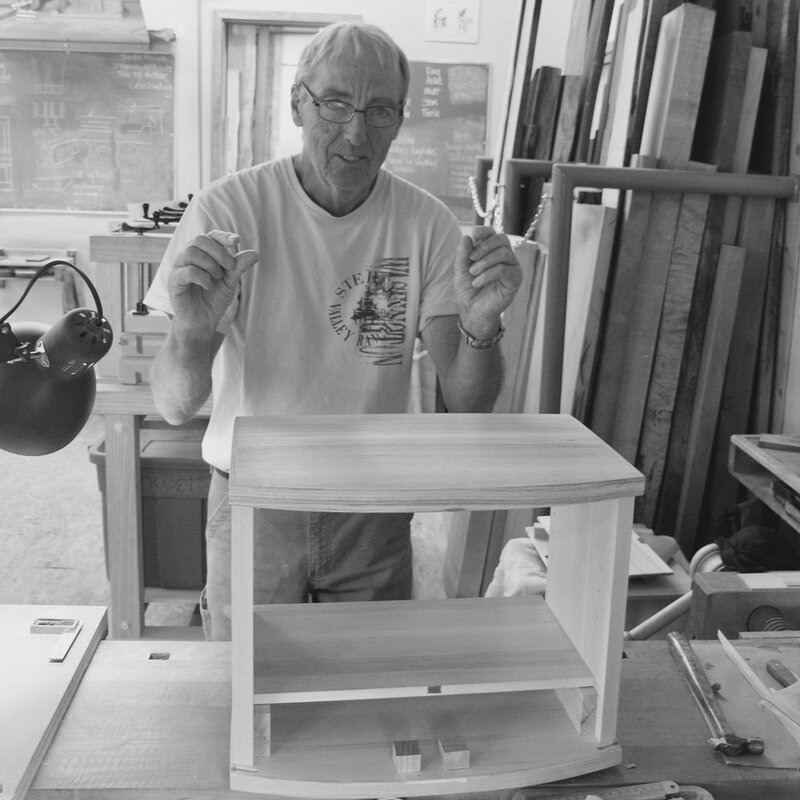 Within a few days of retirement, he returned for the Upward Spiral program where he made a fine cherry box and frame with a spalted maple panel. This past spring he joined us for Vidar’s chair. This term he began his composing program piece a fine double door curved front cabinet on a stand. The wood for the piece came from Goby’s on the wood run to Portland last fall. The tones in this piece of ash range from pinks, to orange to mauve unlike any ash I have seen before. With the wonderful colors came several defects that had to be carefully worked around. The intention was to make the case in solid wood, but once the doors where taken out the remaining wood a challenge to piece together. The decision was made to make lumber core and lay it up with shop sawn veneer and edges. There are many pieces of wood in this fine cabinet. Andi with the doors hung on his lower cabinet. The upper cabinet has since been completed with the glass doors hung and backs installed. Andi just has the pulls and base to complete next term before moving onto his next cabinet. Andi is the first recipient of the newly established Doug Ives Scholarship, which was announced at the celebration of life for Doug held at the school this past September. 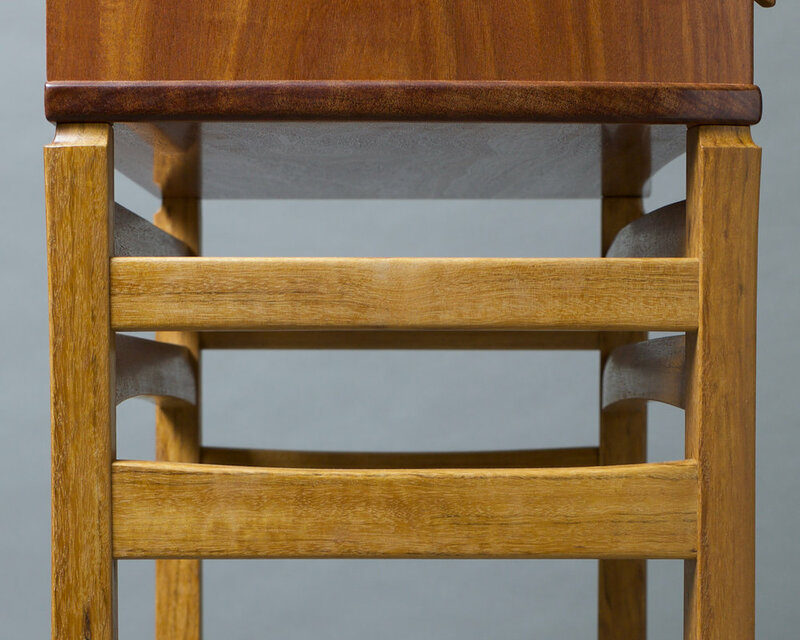 The intention of the scholarship, is to provide graduates of our Impractical Cabinetmaker program the opportunity to continue their studies at the school. Since the celebration of life we have received generous support for this scholarship through Doug’s family and our alumni. If you would like to make a donation to this scholarship, please contact Yvonne. This past term I completed a cabinet that I began thirteen years ago. I took the advice of Michael Burns, one of my teachers who suggested that after leaving school we build one piece a year from the heart. Since founding the school, I have found it a challenge to find the time and the focus required for such work. In the end there were three obstacles that stood in the way of completion of the cabinet. The damage to parts not carefully stored over the years, in many cases with no replacement wood. My abilities as a craftsman and the third the enthusiasm for the piece which wained over the years. As with most pieces I have made, this cabinet began with a piece of wood. In the dark corner of lumber yard in Burlington I found a small piece of Balsamo. I was immediately taken by the warm tones and the spicy floral fragrance which is still evident when one opens and closes the drawers. The balsamo was easy to work with a high angle plane. I have since past along to one of my students. The drawers parts were taken from a thick plank of doussie from Jim. The doussie was straight and rift, with a lovely dark streak that ran down one side of the plank which I aligned through all the drawers. The doussie was easily worked with my planes and spokeshaves. The pulls were a joy to curve with one of Jim's fine knives. 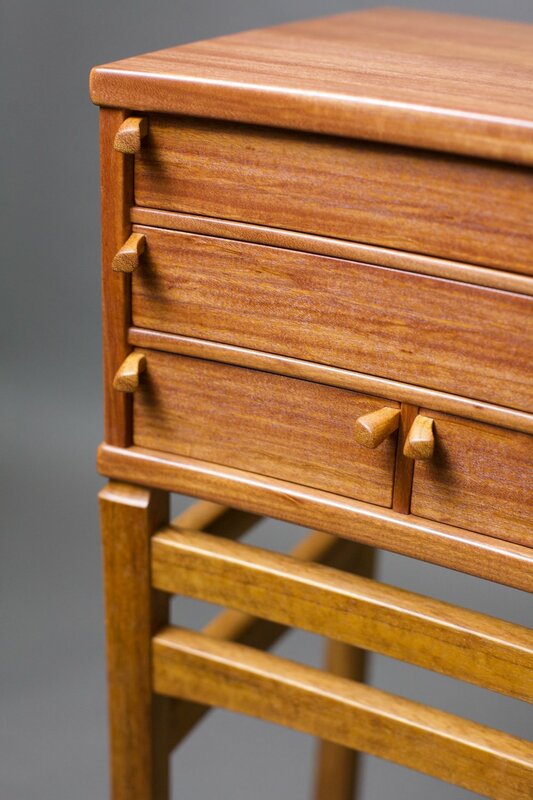 The drawer bottoms are wonderfully fragrant Mendocino cypress with a bit of curl, a gift from Todd Sorenson (now teaching at the Krenov School) during his residency here back in 2007. The wood for the stand we picked up on a wood run on Vancouver Island a few years ago. I was looking for the right piece of yew to make the stand for my cabinet when Gavin, one of my students at the time said, “Would this be any good for making planes?” I said yes, that we had used goncolo alves for planes in the past, but that it would also work for my stand. Gavin was a kind and gentle soul and was very gracious allowing me to have that piece. I cut the shoulders and cheeks of the tenons on Jim’s bandsaw. The wood was very hard and had a lot of defects, but what was usable worked beautifully under Jim’s wonder shave. I would like to take this opportunity to thank our students, our alumni and our families who make it possible for us to pursue this wonderful craft. I would like to thank alumni Tim Andries who has taken on the photography for the school. I will post student work from the last two terms when it is available. I would like to thank Caroline my co-teacher and dear friend who’s efforts enable me to return to the craft that so inspired me to found this school. And of course my partner in life and work, my soul mate Yvonne, who continues to keep it fun lovin’ and groovy.